It is time for Anthony Joshua to again stamp his authority on a heavyweight division that is feeling the ripple effects of its champions and luminaries jostling for position. By fighting in boxing's most prestigious ring, at Madison Square Garden, Joshua can deliver a vicious reminder of who is the true Godfather of New York. Joshua is stepping out of his comfort zone - if, bizarrely, becoming the first boxer to fight in four consecutive stadia with a combined attendance of over quarter-of-a-million can somehow attract criticism of being a comfort zone. It could have been a fifth stadium headline fight, utterly unprecedented, but Wembley Stadium must wait. The decision to meet Jarrell 'Big Baby' Miller on away turf in New York City, at the world-famous Garden, is a pointed attempt to expand Joshua's horizons just when it seemed his brand of brutality and bonhomie could grow no further. The IBF, WBA and WBO champion needs no reminder that another British heavyweight shone on American shores recently. Tyson Fury emerged without Deontay Wilder's WBC belt when they memorably drew last December in Los Angeles, but returned home with his reputation restored which will ultimately prove more valuable to him. Fury and Wilder's first fight, regardless of the outcome, would likely have resulted in a rematch and that is being set up - Joshua's upwards trajectory continues without them. Those three men enthuse over taking each other's unbeaten records. Those fights will happen. They must. So if 2018 was the year that Joshua solidified himself as the man to beat, 2019 must be about rediscovering the hunger of a challenger and wiping out anybody who questions his authority. The loudest bark has come from 'Big Baby', a colossus from the same borough as Mike Tyson, whose bite will now be tested. Aged 30 and without a loss in 24 fights, 'Big Baby' carries a 22-stone physique into the ring which, in itself, is a puzzle for Joshua (17st 8lbs last time out) to figure out. We don't yet know the ceiling of the American challenger's ability but if he can take a shot, this fight could become a thankless task for the champion who might suddenly feel 3,000 miles from home. They have already clashed once at a press conference in New York where the baiting from 'Big Baby' brought out Joshua's nasty side. Expect to see more of this. 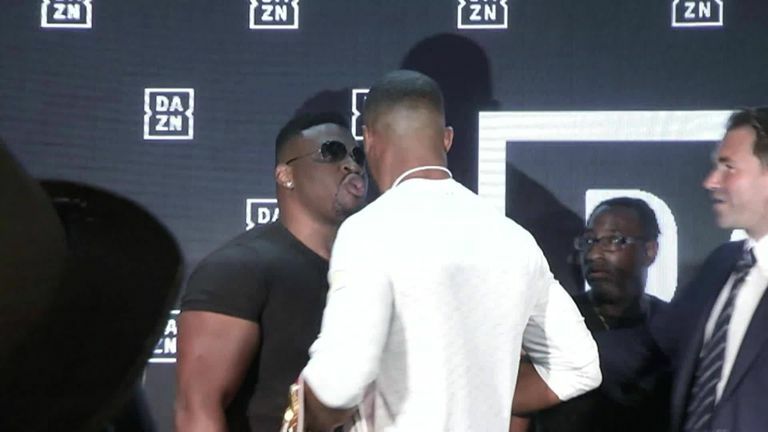 Jarrell 'Big Baby' Miller certainly got under the skin of Anthony Joshua when they met last summer... will he try it again before June 1? Ultimately 'Big Baby' was the man who signed on the dotted line to fight Joshua, the man who everybody challenges but not everybody steps in the ring with. This will be the New York native's first fight at Madison Square Garden, the hub of sporting greatness at the heart of his city, but at least he won't have to deal with a 90,000 seat stadium like Joshua's previous few opponents. Joshua, then, must come to terms with being in the US. We have already seen him courtside with Steph Curry, become pally with Tom Hanks and feature on James Corden's Late Late Show. You feel like the American public will love his personality and the sports fans will admire his boxing. The stage is set for Joshua to star at the venue where Muhammad Ali lost to Joe Frazier then beat him, Tyson fought (only) twice, and Lennox Lewis drew with Evander Holyfield.